Comerica Incorporated is a financial services company strategically aligned by three business segments: The Business Bank, The Retail Bank, and Wealth Management. Comerica focuses on relationships, helping people and businesses achieve success. 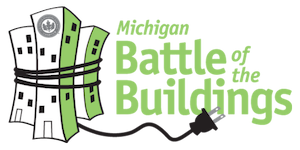 Comerica has found a home with the Michigan Battle of the Buildings competition, building on its 2016 First Place finish in the office category by landing both the First and Second Place positions this year. Last year’s winner with a 21.3 percent reduction in energy usage, Comerica’s Stadium Pauline Banking Center in Ann Arbor again achieved the leading position, with additional reductions of 28.2 percent. Comerica’s Jackson Main Banking Center in Jackson secured second place, with a reduction of 22.3 percent. Comerica has established a series of 2020 Environmental Sustainability Goals focused on reducing emissions, water, waste and paper usage. The company will publish updated data on its progress as part of its comprehensive corporate sustainability report later this year. Comerica believes that enhanced building controls and other initiatives should help it to meet and even exceed its 20 percent greenhouse gas (GHG) reduction goal. Pictured from left to right: Scott Beckerman-Comerica Incorporated, Cathy Moretto-CBRE.